A walk of about 2.9 miles. 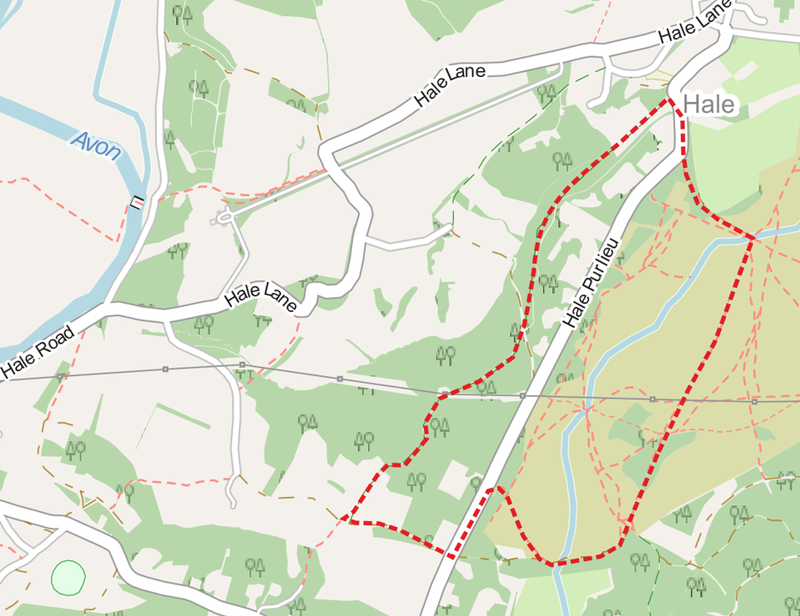 The route starts at the car park by Warren Farm and then heads out across Hale Purlieu before returning through Sticklands Plantation. Hale Purlieu is a National Trust common. It is a site of special interest for mammals, birds, reptiles and invertebrates which inhabit both the heathland and the wet bog areas. Important breeding populations of butterflies, moths, beetles and dragonflies can be found here. For centuries this area was “disafforested” (the meaning of “purlieu”) and not subject to forest law. It was brought within the boundary of the New Forest in 1964. Warren Farm Car Park. From the back of the car park, head half-right down into the valley along one of the many paths, aiming for the treeline. Ford Turn left along a path which follows the treeline. Cross the ford and head up the hill with the treeline on your right. Gravel Track At the top of the slope, turn left along a gravel track heading towards the pylons. Another ford! After passing under the power lines, the track gently descends to another ford. The track turns left and heads up towards some the trees. Stay on this track, with the fence on your right, until it reaches the road. Road Turn right along the road. Gate Look for a gate on the left just before the road bottoms out in the dip. Go through the gate onto the bridlepath. Crossroads The path crosses another track (a by-way). Go straight ahead. Pylon The path goes straight underneath a pylon and then descends through rhododendron bushes. Homet The path emerges from Stricklands Plantation onto a track beside ‘Homet’. Bear left up the drive. Track At the top of the drive, turn left along a wide gravel track. Road Across a cattlegrid, the track rejoins the road. Turn left and head back to the car park.